The colours are brighter, the air feels warmer and that can only mean one thing - Spring has sprung! The best season of the year is upon us and we have decided to celebrate with only the freshest, fruitiest concoctions! Prepare these cocktail jugs for those delightful afternoons in the garden, entertaining friends or even just because you have the ingredients at home – we won’t judge. Get creative, buy the freshest seasonal ingredients you can and don’t be afraid to taste as you go, after all that is half the fun. Even just looking at an image of a tall glass of Pimm’s brings back floods of sitting on the Thames, soaking in some sunshine and dying of chronic hay fever! Use only the freshest Spring fruit and make sure you have more than enough for two jugs, because you won’t be able to stop at just one! Place all alcohol, ice and fruit in a jug. Give it a good swizzle to get all the flavours melding together and top with prosecco. Serve in glasses with fresh fruit, ice and mint tips. If you want a sweeter drink, swap half of the prosecco for lemonade. Don’t feel restricted to strawberries, orange and cucumber, get creative and try it with whatever seasonal fruit you find at your local market! The golden Bundaberg type may have caused some mental scaring back in the day, but you have to get back on the horse some time and this is the perfect spring thirst-quencher to get you back on the horse! Whole lime, sliced into eighths. Working with 1 part Sailor Jerry’s to 3 parts Ginger beer. Start with the Sailor Jerry’s, build on ice with lime and mint and top with ginger beer. Serve in tall glasses with fresh ice and garnish with candied ginger for extra bite! The spicier the ginger beer, the better! Now we aren’t saying we’ve over indulged this winter (our waistline says otherwise), but we are going to take this classic in liquid form. For that extra little touch, garnish each glass with some crushed ice, arrowroot biscuit and a sprinkle of cinnamon. Place alcohol in jug, top with ice and remaining ingredients. Give it a good stir and serve in jam jars with fresh ice and suggested garnish. Tasty is the aim and fresh is the game. This is spring in a cup and drawing inspiration from local fruits that will be in season for the next few months, this is a no fuss delicious jug that anyone can get behind. As it is dry sherry, it won’t rush to your head all at once, but we suggest keeping this bad boy cold for maximum flavour! Place alcohol in jug, top with ice, fruit and tonic. Give a good stir and serve in glasses with more fresh fruit and ice. They say berries are full of all the good stuff, so why not be healthy why you sip away the Spring, one Berry Bunch jug at a time. Don’t feel restricted to just blackberries, the more the berrier we say! 500mls of Cloudy Apple Juice. Place alcohol in jug, muddle in lemon and blackberries, top with ice and apple juice. 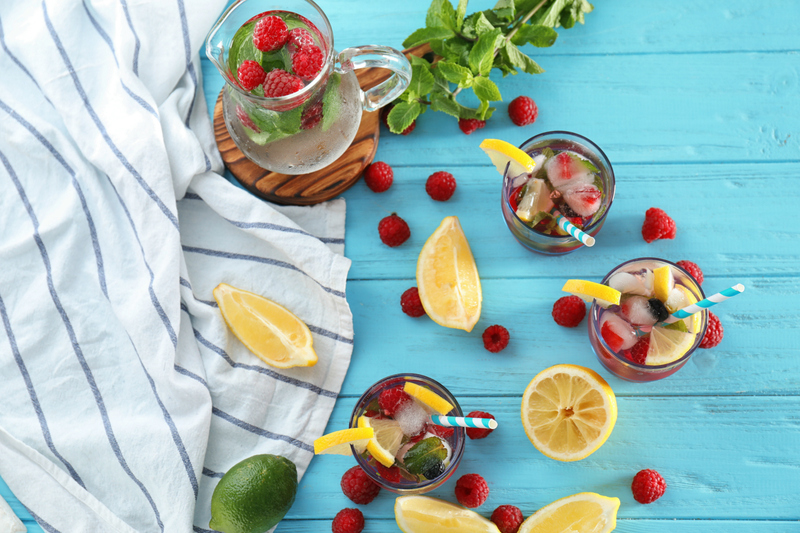 Stir well and serve in glasses with ice, fresh lemon wedge and blackberries. If this all seems a bit too hard, leave it up to the professionals and get them to make you some of the best cocktail jugs in town! - the gourmand who wishes goon punch counted as a spring cocktail.